Shares in PEACHES will be available for trade on the Berlin Stock Exchange from January 28th. The initial share price will be determined on the same day. "In our opinion, it is essential that our shares are traded on a variety of stock exchanges," said Matthias Mathieu, CEO of PEACHES AG. "As a German company, we are happy to be listed on our capital city's stock exchange." The key competencies of the Peaches Group can be divided into two separate segments: Payment & Prepaid Services. The Group has a wealth of experience in mobile payment services and has established itself as an independent mobile payment acquirer and trusted service manager delivering its own mobile payment technology platforms. Peaches also acts as a reseller (payment service provider (PSP)) for the mpass mobile payment system from Telekom, Vodafone and O2. The Peaches Group is also a provider of prepaid top-up solutions. 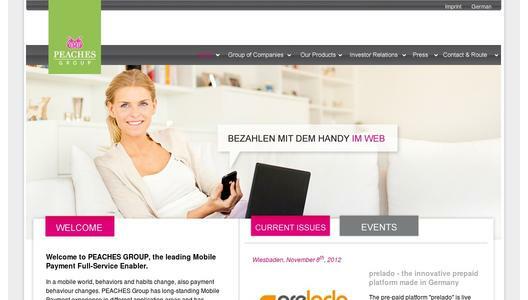 Under its "prelado - prepaid anytime & anywhere" brand, the Wiesbaden-based group runs its own prepaid service platform. It provides users with a real-time top-up service for pay as you go mobile phones available through an app, on mobile web or the internet. Via the app (Android & iOS), users can also access a free service showing them their remaining credit irrespective of the network they are on. The Peaches Group includes PEACHES Systems GmbH, PEACHES Mobile GmbH and REA MOBILE GmbH - Companies of PEACHES AG.